"The miracle isn't the I finished, it's that I had enough coffee to start." I saw that quote on Instagram the other day and it made me chuckle, but honestly I think there's some truth behind that. I don't know about the rest of you, but I think getting out of bed for my run or gym session is the hardest part of the whole workout! It takes a lot of motivation and dedication to get up and get started on your day hours before you technically need to. So here are some of my tips for getting up and getting chic done! You don't have to spend a lot of money on workout clothes, but make sure you get something you're genuinely excited to put on. This will not only make working out feel like less of a chore, but hopefully the idea of wasting money on something will motivated you to actually use them. 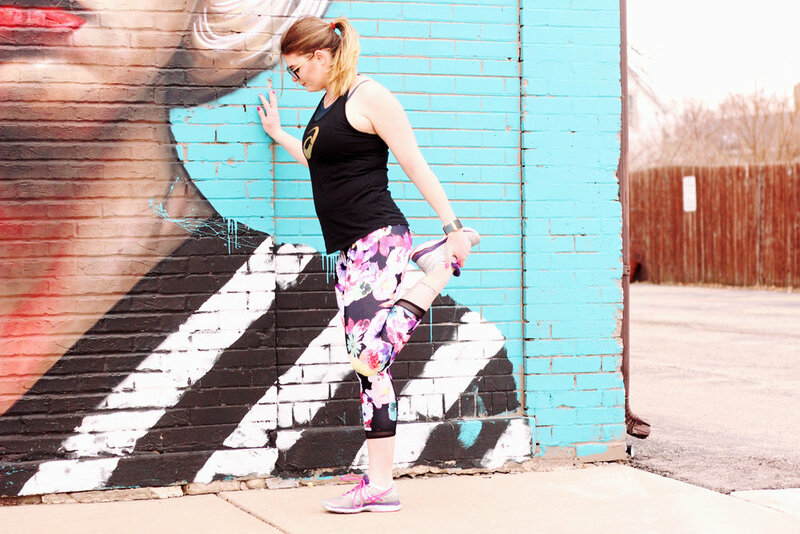 Some of my favorite places to shop for active wear are Old Navy, Target, Forever 21, Fabletics and (of course!) ASICS. All have cute, durable clothes and usually have some good sales running, too. I'm a huge fan of working out alone. It gives me time with my own thoughts and I swear it's more effective than therapy. But sometimes mixing up your workout by training with a friend can be a nice break from the monotony of hitting the gym alone. I like to schedule my gym dates early - that way I have to get and get started on my day, and I have time later in the day to do other things I need to get done (like laundry or the dishes). If you're not motivated to do what you've been doing, maybe it's time to switch it up! There are so many amazing resources online of different workouts to try, so there's no excuse to do the same thing every day if you're just not feeling it. Some of my favorites resources are Lauren Gleisberg's blog, the Fitness Blender, the Fitness Marshall, and the weekly workout posts on PaleOMG. If the weather is nice enough, get outside! If you've been working out at home, try going to the gym. If you're going to the gym, workout at home or a different location. I don't know about all gyms, but I go to Anytime Fitness and since it's a franchise every location is a little bit different. Sometimes just going to a location I don't normally frequent is enough to get me back in the zone and excited to workout! Loss of motivation is bound to happen at some point in your journey, but if you've tried all of the above tips and you still just don't feel any change, maybe you just need a break. Taking time off from the gym to focus on other kinds of self love can be just as important as getting in a good workout. So push snooze one or two days, take extra time to cook breakfast in the morning, sit outside with a cup of coffee and listen to the birds - whatever it is, just give yourself permission to take time off and enjoy life.